Look closely….ballerinas are dancing all over this toddler-size dress (1-2 years)! 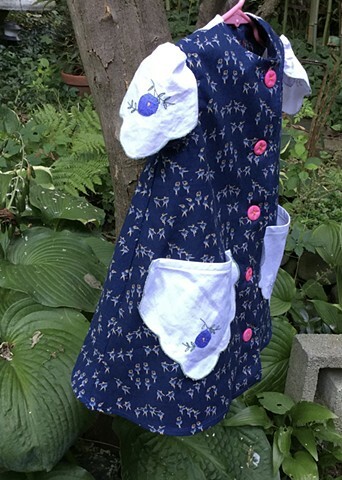 Enhanced with vintage appliquéd textiles that appear on the pockets, cap sleeves and the most colorful one (drumroll please) on the back, closes all the way down the front in big pink buttons, making “I can do it” attitude of getting on and off easier. Deep back pleat allows wide skirt to easily go over leggings and make room for imitating real ballerinas. 100% cotton, $70, made by the designer herself and shipped free to any address in the U.S. #260.